You are probably wondering, dear reader, why I am posting at this time of the morning, apart from in homage to Renee Artois (very old British TV reference for those who have no idea what I am talking about). Well, I will be celebrating six years in Dubai in September, and I have yet to take part in the rigours of Ramadan in any meaningful way. So this year, I am following the path of a hundred other journalists who have turned around in the broiling heat of the UAE summer and realised they are fresh out of things to write about, and for one day only, I am going to attempt fasting during the daylight hours. This is why I am up before the sun chowing down on my usual breakfast of yoghurt, fruit and tea plus an extra side order of Camembert sandwiches. No, Camembert is not a traditional pre fast snack, but it's what I had to hand this early. It turns out the pictured beverage is something of an institution for breaking your fast in the UAE (of which more later), so I thought, "when not in Rome, indulge in the idiosyncrasies of the locals". Ie, I'll be having some of that later. I realise the original version of that saying is somewhat catchier, but it is very early. I was going to try to scarf down some for the pre-dawn meal, but reader, I just couldn't. Anyway, I shall be keeping you updated on how I am doing throughout the day. Lucky you. I will probably be doing very badly as I'm the kind of person who turns into a psychotic fiend if I am separated from my food supply for more than two hours. I've chosen a day when Desert Baby is at nursery because she is a girl after my own heart, ie, needs plenty of snacks and reviving treats on a half hourly basis, so I thought best stay away from that temptation. I also have two freelance jobs on so I'll have plenty to distract me from food daydreams. I'll tell you what, though, it isn't half hard to sit down at a desk and start writing without a cup of tea. I think thirst is going to be the biggest challenge throughout the day. There will be highs of 39C today, which for a Dubai summer isn't that bad, but that's still hot enough for you to want to gulp a glass of water when you get indoors after any time at all spent outside. So I think the dashes from house to car, car to nursery and back again will be my only trips outside today. I really want a cup of tea. I mean really want one. A thought just occurred to me - what to people who are fasting do to break up the day? I'm accustomed to a point in the day when I stop working (staring blankly at a screen) get up, move around, prepare lunch (intend to have salad, usually something in a sandwich). I am realising how much I use tea, coffee and water as a procrastination device. I reckon I would normally have had three glasses of water and be on my third or fourth coffee or tea by now. As it is, that one at 5.10am is starting to feel like a loooooooooooong time ago. I am officially fed up now. Can't imagine doing this for 30 days. Also, I am realising how I get a lot of my body heat from eating and drinking, particularly the large quantity of hot drinks I usually have during the day. I've had to shut of the air conditioning, something that happens not that often during a Dubai summer. Only six hours to go. So I'm well past the half way point. My eyes feel puffy. What's that about? I think I'm reaching the hysterical stage now. I was just remembering the 24 Hour Famine thing we used to do at school to raise money for people in areas of the world where there were food shortages. I seem to remember we were allowed water, were we not, or it would have had health implications. That was ONE DAY. I honestly can't imagine doing this for 30 days. I just tortured myself by watching of video of how to make Upside Down Banana Cake on facebook. Why do I do these things to myself? 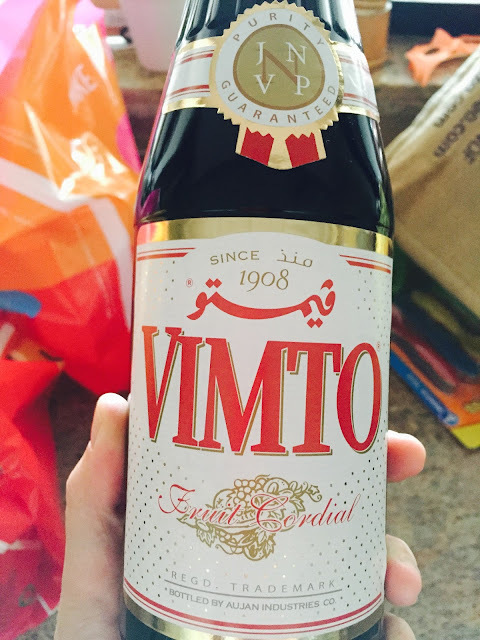 Vimto has a key role in the tradition of breaking your fast at Iftar in the UAE and the Gulf. Either that or the PR company in charge of promoting it has done one heck of a job pushing it this year, as the newspapers are full of articles about the rise of the sticky syrup and it's prominently displayed in every supermarket. I’ve read references to it “bringing you back to life” at the end of a long day of fasting (a little under 14 hours at the moment according to the UAE sunrise and sunset times) and it’s perhaps not surprising when there’s 13g of sugar per 100ml. Yikes, diabetes in a bottle. The version available in the UAE is made in Saudi Arabia and has been since 1927, so it was the purple stuff that fuelled the region long before the black stuff (oil). I suspect the UK version is far less sweet due to boring little politically correct things like not wanting the nation to lose all their teeth before the age of 35. Either way, as a fan of the works of P G Wodehouse, I think it’s crying out for a 1930s style advertising campaign involving the word “vim” – a word which should never have fallen out of usage in my opinion. 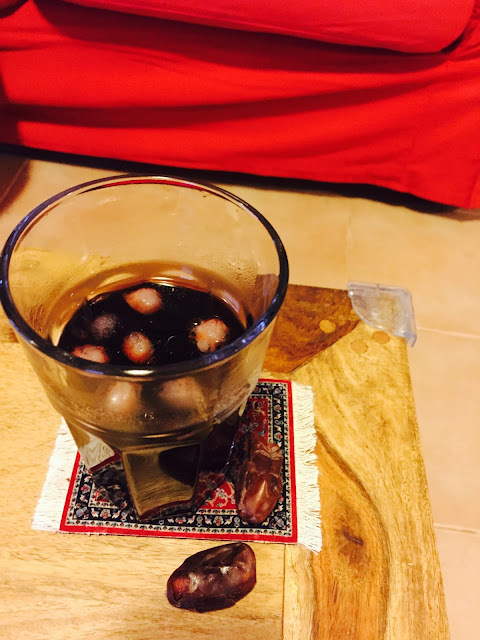 A glass of the aforementioned "Vim Tonic" and some dates. You eat a lot of dates in the Gulf, but these were definitely the tastiest I have had for a while, even though they were the bog standard Carrefour ones you serve yourself, rather than the endless varieties packaged in fancy boxes you can buy in the supermarkets at this time of year. I have to say, I can't say that I'll be buying Vimto regularly. Very odd tasting stuff if you ask me. So, the last couple of hours of the fast were the worst, except for the early hours of temptation to just have one little cup of tea. After 5pm was when the dehydration headache, which I haven't quite managed to shake off yet, set in. Luckily for me, Him Indoors cooked a dinner of sausages which we ate in front of Peaky Blinders. I was subdued enough by the day's exertions to not get too irate with the annoying blonde girl police spy Grace, who is always banging on about making men cry with her singing, when she's really not that great at it. I've read a bit during today about why fasting is the done thing during Ramadan. There are lots of reasons - some of them include feeling greater affinity with those who have less, feeling closer to God, etc. I'm pretty sure there was no spiritual experience in Sand Witch Towers, just a greater level of grumpiness and a marked dip in productivity, but I will definitely have greater empathy for those who observe the fast for 30 days from now on.